"I'm the person and the player I am because of the community I have here," said Seattle pianist Dave Peck. "Back in the '70s, I might have thought about moving to New York. But when I started being house piano player at [the now defunct] Parnell's and Jazz Alley, I got to play with Sonny Stitt for a week, then I'd be playing with Chet Baker a couple of weeks later. That was the bird in the hand." Peck still has no intention of leaving the Emerald City. But his sphere of influence is definitely expanding. Last June, he guested on Marian McPartland's "Piano Jazz" then signed up with ArtistShare, the online endeavor that has done so much for Maria Schneider. Peck just released his second trio album, Good Road (ArtistShare), with drummer Joe La Barbera (who played with one of Peck's main inspirations, Bill Evans) and bassist Jeff Johnson. After many ups and downs, the 52-year-old pianist has arrived at a personal lyric voice with regional resonance and he's ready to take it out on that "good road." Raised outside Portland, Ore., playing both piano and trumpet, Peck landed in Seattle in 1978 after an r&b keyboard gig fell through in Canada. Soon, he was teaching at Cornish College and working as a sideman for Seattle vocalist Ernestine Anderson and saxophonist Bud Shank. When touring musicians stopped picking up local trios, Peck became discouraged. He went back to school to study physics and wrote science fiction. His spirits picked up when Shank recorded Tales Of The Pilot: Bud Shank Plays The Music Of Dave Peck (Capri, 1990). But in 1995, Peck made another retreat, this time not by choice. Struck by Chronic Fatigue Syndrome-ironically, the same disease that beleaguered one of his other inspirations, Keith Jarrett-Peck was forced to take a year-long leave of absence from teaching. 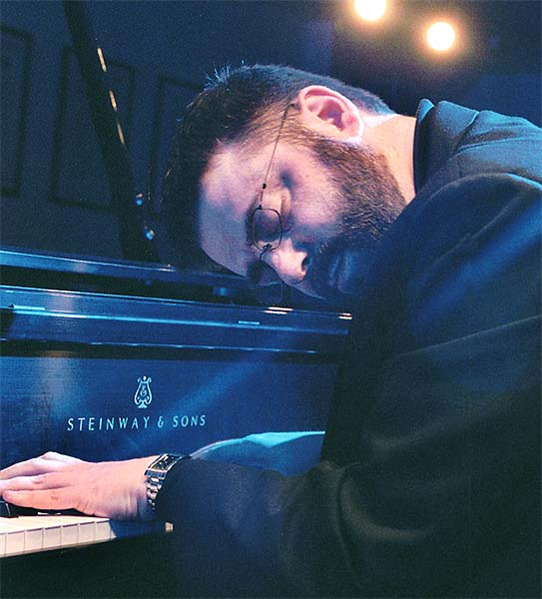 "When I started to come back, it was all about making choices," said Peck, who turned his full attention to playing and recording with a piano trio. In 1998, he and his wife, Jane, started their own label, Let's Play Stella, and released Trio. Seattle's reputation rests on rain, but folks who live there know it for the gentle contours of its clouds and mountains, its soft mists and almost mystical sense of natural intimacy. All that comes through in Peck's playing-lyrical and pastel, swinging and bluesy, with a ringing, crystalline touch. "I like the pure expression of melody," Peck said. "Something that's important when you play a melody is breathing, so the phrasing is like language. I got that from listening to Miles, and from playing the trumpet myself." One of the most attractive cuts on Good Road is the Jerome Kern ballad "Yesterdays," which Peck boils down to a brooding, simple phrase at the start. "I'm famous for making harmonies more complex, "he said. "But I've also found that it's possible to actually simplify." Peck and his wife, Jane Peck, who used to sing with him, love digging up obscure tunes. "Low Key Lightly" is the song Duke Ellington performs in the bar scene in the film Anatomy Of A Murder, for which Ellington also wrote the score. "The Star Crossed Lovers," also by Ellington (and Billy Strayhorn), features an odd leap to a raised fifth with a chord that just doesn't seem to fit. "The weirder note is the next one," he said, "with F in the melody and an E chord, but that's one reason I like it. It violates the rules." Some of the outtakes from Good Road will be available on Peck's web site, davepeckmusic.com, one of a projected 15O pieces of content, including lessons, charts, interviews, downloads and a "tune a month" feature. At this point, his focus is on standards. "The way those tunes are put together," he said, "it's easy for everyone to know where home is. Right away, you can begin to stretch out and go many places because home is always there."